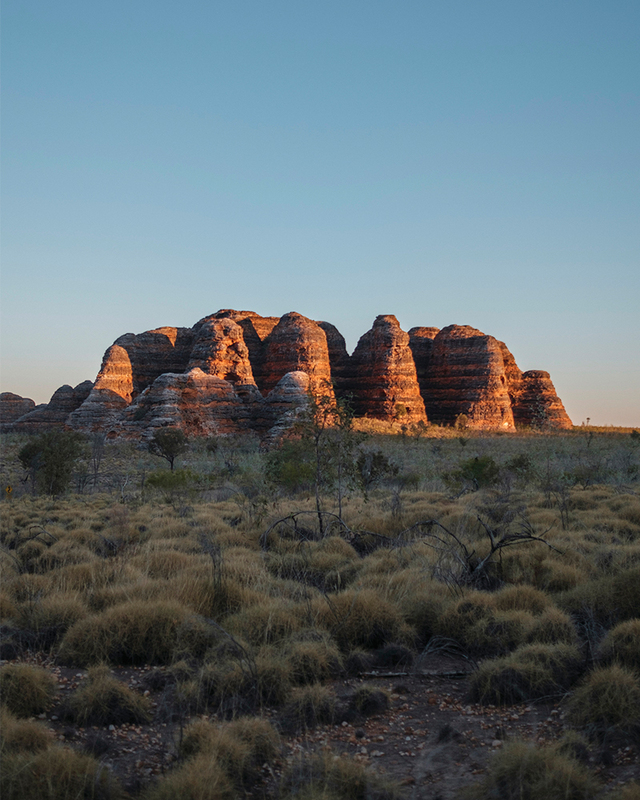 From the Kimberley and the Pilbara, right down to the South West, Western Australia is awash with incredible sights. There are enough beaches, gorges, deserts, rocks and forests to fill an Instagram feed forevermore. Here are some of the most stunning places you had no idea were in WA. With gorgeous gorges galore, if you’re brave enough to travel the 3,100 kilometres up there, the Bungle Bungles stunning scenery will not disappoint. Take in the view from Walangindji Sunset Lookout or hike through Cathedral Gorge, Piccaninny Creek Walk, Mini Palms Gorge and Echidna Chasm. A three-hour red dirt drive from Broome, Cape Leveque is worth the extra effort to get to. Imagine bright red pindan leading into white sandy shores and bright blue water and you’re half way there. Make a beeline for Kooljaman where you can glamp in deluxe safari tents with stunning views. One of the top spots along the Gibb River Road, we’re super glad that plans to dam the Fitzroy River didn’t go ahead because Diamond Gorge is an absolute stunner. You’ll definitely want to hop in a canoe to experience it in all its glory. Right at the top end of WA a waterfall wonderland awaits at Mitchell Falls. If the long walk out to the falls has got you all hot and bothered you can take a dip in the natural pool at the very top (the bottom two tiers are home to crocs, yikes). To see Mitchell Falls in all its glory, hop on a helicopter for a six-minute joyride. Aside from any tourists you might stumble across, a walk through Windjana Gorge will have you feeling like you’re the only person on the planet. Surrounded by 100-metre-high rock walls, the gorge winds along the Lennard River—and yes, you could get up close and personal with freshwater crocs, but it’s best to leave them alone sunning themselves on the sandy shores. You could spend your entire time up north in El Questro, it’s so bloody beautiful, but if you’re short on time you’ve got to make it to Zebedee Springs. The thermal rock pools are just as glorious to take a dip in as they are to look at. One of the further afield gorges at Karijini National Park, Hamersley Gorge is totally worth the hike, especially for the reward of floating in the natural rock pool. It’ll refresh you just enough before your one-and-a-half-hour return journey. Don’t let the foreboding name fool you, Python Pool is much prettier than it sounds. Pack your bathers and everything you need for a BBQ and enjoy an afternoon looking out at the rock formations. 20 minutes off the coast of Onslow, the Mackerel Islands are a wonderland for fishermen, divers, snorkelers and anyone who likes looking at pretty things and swimming in crystal clear water. WA’s smaller, but still stunning version of Ayres Rock, Mount Augustus is estimated to be 1750 million years old and stands at 1105 metres tall. You can climb to the top or revel in its beauty from ground level, it’s up to you. Many of us spent summer holidays up at Kalbarri but one of its lesser-known parts is the Blue Holes. With rock pools and white sandy shores, pack your snorkel and check out the underwater wonderland that awaits. White sandy beaches and pristine blue waters firmly secure Little Bay in Horrocks on this list. You might even spot some humpback whales while you’re there. Pink Lake in Esperance is exactly what you’d expect, a pink lake, and it’s a stunner (especially from the air if you can wrangle a chopper or plane). 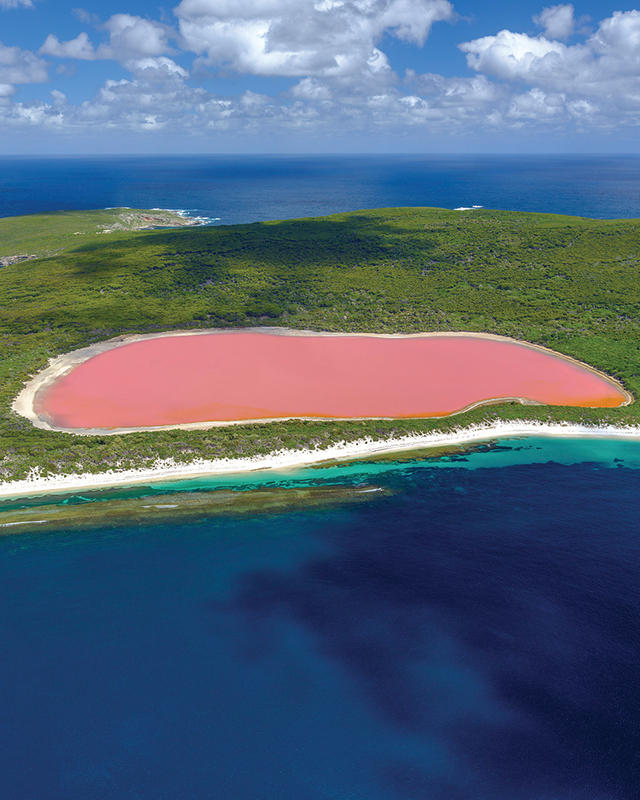 Best to check ahead and see if the lake is actually pink before you visit though, as its colours can vary depending on the amount of salt tolerant algae. Some might not think a desert is much to look at but sometimes it’s the simple things in life that are the most beautiful. The fifth largest desert in Australia, you wouldn’t want to get stuck in the Gibson Desert because it’s pretty baron, but the red dirt and spinifex make for a pretty photo. Elachbutting Rock is much easier to look at than it is to say. With a similar, wave-like, appearance to Wave Rock, there are numerous spots to explore including Monty’s Pass, The Bluff and The Crater. When the wildflowers are in season, a journey on Wheatbelt Way is breathtaking. The best time to visit is in September. Just about everywhere you look in the Boranup Forest is beautiful, but staring up into the canopy of 60-metre-high karri trees is the ticket. Only 25 minutes from Margs by car, definitely stop by this spot on your next trip down south. Nestled into a tingle and karri forest in Walpole the Giant Tingle Tree awaits your Instagram snaps. Standing at 24-metres tall, the base of its trunk is hollowed out so you can walk right through it. You wouldn’t want to get caught out in a rip at Redgate Beach, but you certainly wouldn’t mind getting a flat tyre as it’s pretty special to look at. Watch the waves rumble in, smashing over boulders and brave the water for a dip if the conditions are in your favour. The Aquarium is legitimately one of the most beautiful spots in WA. Yallingup’s best-kept secret, you’ve got to get in the water with your snorkel to experience this place in all its glory. Crystal clear waters and rocky outcrops await at Two People’s Bay, 35 kilometres east of Albany. Little Beach is especially picturesque, to get there take the Heritage Trail. Anyone who’s been to Denmark will probably know Elephant Rocks, but because we know a lot of you travel to Bali any chance you get we’re including it in this roundup because it’s a must visit if you like looking at pretty things. What to expect: smooth, elephant-like rocks popping out of a clear, blue ocean. If you’re going to brave the wild wild West, here 10 of the most beautiful camping spots in WA.